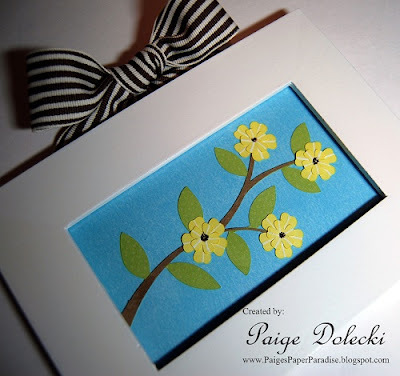 Paige Dolecki - Stampologist: Springtime Color Challenge for Heart2Heart Challenges! Springtime Color Challenge for Heart2Heart Challenges! The Heart 2 Heart Challenge for this week is a color challenge! We are challenged to use Sweet Leaf, Sky Blue and Sunkiss Yellow for our projects. When I was playing around with the colors all I could think is what a pretty springtime picture they would make - so that's what I made! I think this will look great by my front door or in the half bath to welcome spring. Here is a close up of the layered flowers. I used a picture frame I bought at the Target dollar spot a couple of years ago and added a sweet hanging bow with our Chocoloate Striped Grosgrain Ribbon. 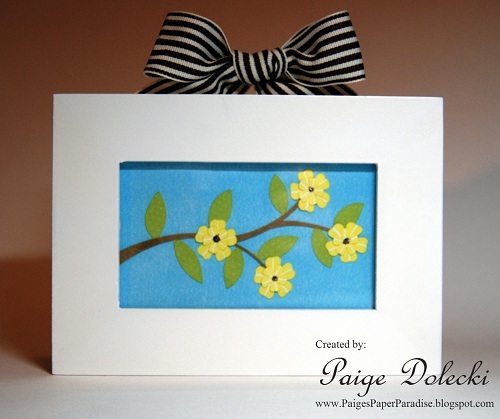 Everything was cut using the Art Philosophy Cartridge and I did a little bit of stamping on the leaves with the polka dot stamp from "Diverse Backgrounds". I used a white gel pen and Bronze Glitz to accent the flowers. Paige, I love that you made this into a picture! How pretty!